Color Changing Nu-tek Lyte Ring 6 RGB - Newly updated! This light USED to come with 28 lights but now comes with 6 that are WAY brighter! It also now includes the remote control! Perfect for placing on top of our chandeliers and on top of floral arrangements for super cool downlighting! 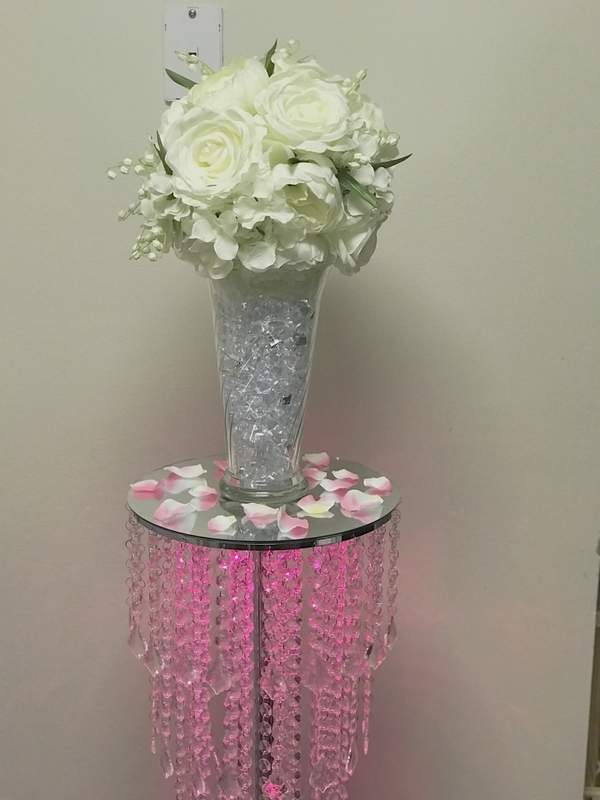 You can also place it around the bottom of a vase to uplight your creations in a variety of colors. DON'T MISS THE SHORT DEMO VIDEO OF THIS PRODUCT AT THE BOTTOM OF THIS PAGE! What's cool about the open center design is that if you use it on top of a vase, the floral display (or other items) can come up through the center and become illuminated as well! 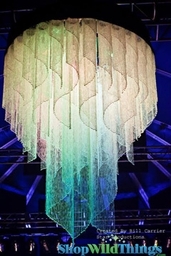 Acolyte is the GOLD STANDARD in event lighting. If you want your lights to work, and work right, get them from us, and choose ACOLYTE brand! Our Point N Party Series of LED Lights are compatible with our Acolyte RGB Remote Control. You can control many of these lights with a single remote control. 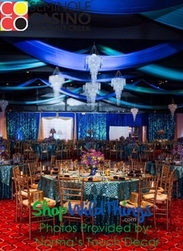 How wonderful to put together your displays, and not have to turn on the lights right before your party or event. Just use your remote control to turn the lights on and off and also to set the color from changing to constant, one color. 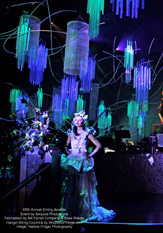 See the video below to view how our beautiful RGB lights change colors! - 6" in diameter and 1.25" tall. 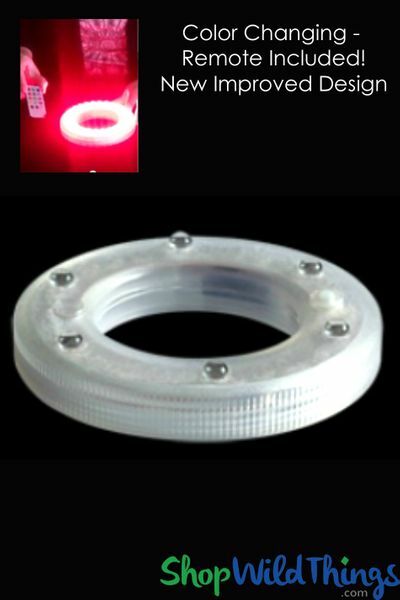 - The opening circle (the hole) inside of this light is 3 1/4"
Use it to illuminate floral arrangements, props, centerpieces, serving trays, candles, ice sculptures, place settings and more. 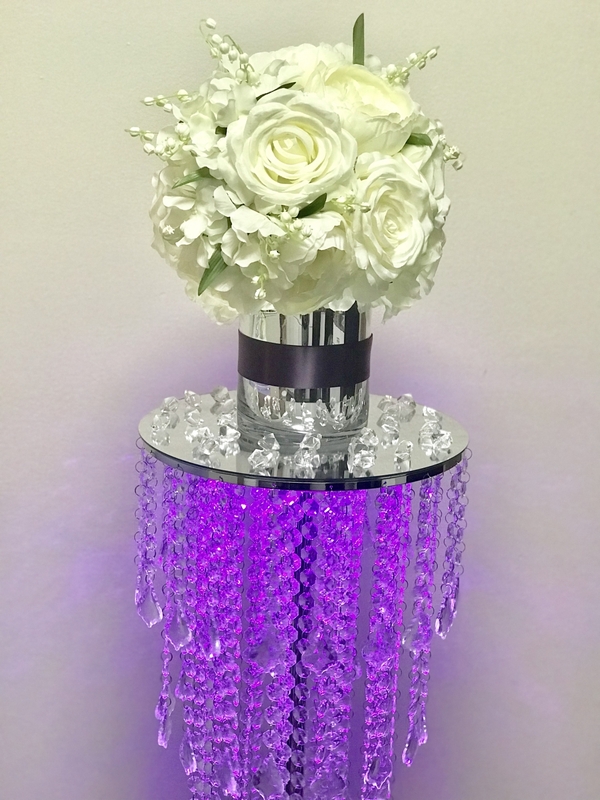 Whether you are looking to illuminate gel beads or acrylic crystals inside floral vases, or light up table skirting, centerpieces or ice sculptures, Acolyte has a product for your every design lighting need. 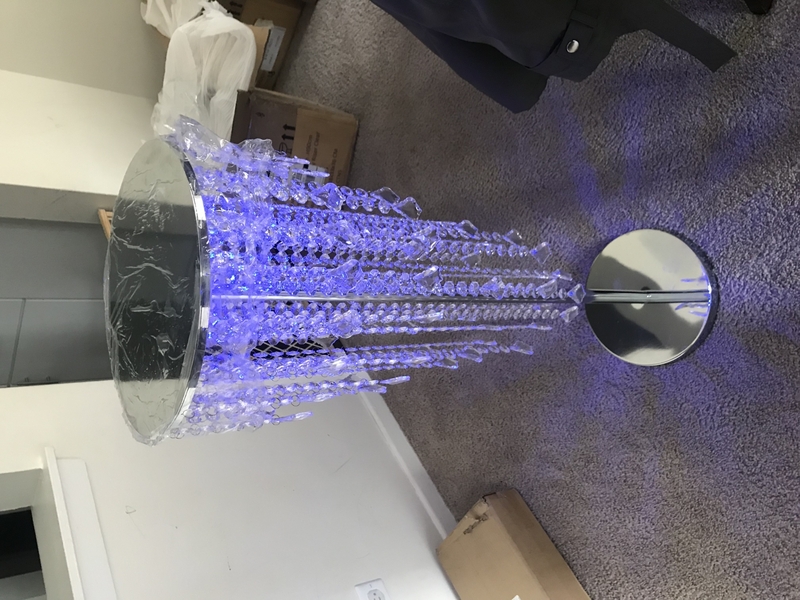 And the best part about our lights is that the LED bulbs themselves last thousands of hours, are cool to the touch, are very energy efficient which is great for the environment and best of all are completely wireless so you won't trip over them. 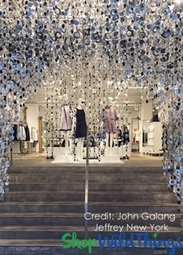 All our lighting products are constructed with the highest quality lead-free materials. And most of our products are battery operated such that you can use them over and over and over again. 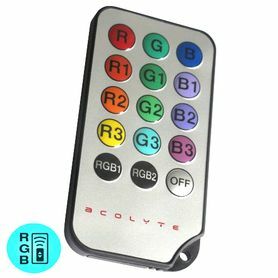 You will need an RGB Remote control for all RGB Remote Control Compatible LED Lights (remote is now included!). If you do not get the remote, you can change the colors using the buttons on the unit, but will not get as many color variations or the automatic color changing function. The automatic color changing function makes the light change to many colors in a rotation while it is on. The remote control is needed in order to change the colors of this light. 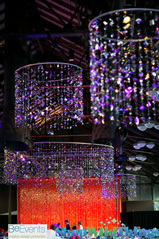 It will change the colors of these RGB lights to many shades of Red, Pink, Purple, Blue, Green, Yellow etc! Each button on the remote changes the color slightly. 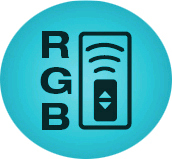 You can choose a solid color, OR you can use the RGB1 (slow) or RBG2 buttons which will change the light color over and over. 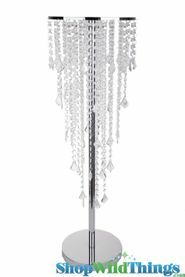 This is an awesome and inexpensive way to add some serious drama to your space. Please watch the short video below but note: this item now comes with 6 lights instead of 28, and it's even brighter now with the latest technology. This is a great product. I got 2, loved it so much that Im getting more. I just wish it was more affordable but I would definitely recommend it. Merchant Response:Thank you so much for your review and fabulous photos!! ProsLight weight, transparent/clear, blends in perfectly well under my chandelier. Easy of use ,work great! no more cords! 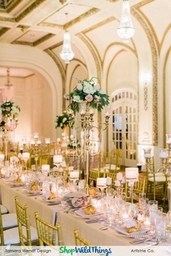 Great to light up chandeliers and crystal columns ! - 6" in diameter and 1.25" tall. - 28 very bright LED lights. It has an On/Off Switch. - Manual Operation: 6 different color options plus 1 RGB color changing function - Remote Control Operation: 12 different color options plus 2 RGB color changing functions - On/Off Button - Color Selection Button - Lasts 8 hours per battery set - Includes 3 Replaceable AA batteries - may also be used with Acolyte RGB Remote Controls..